The challenge at Less Is More this week is a recipe to use a recycled item..it can be anything, card, ribbon, paper, metal... anything that has been used before! I made a very simple card using a hang tag from an item of clothing that I bought. 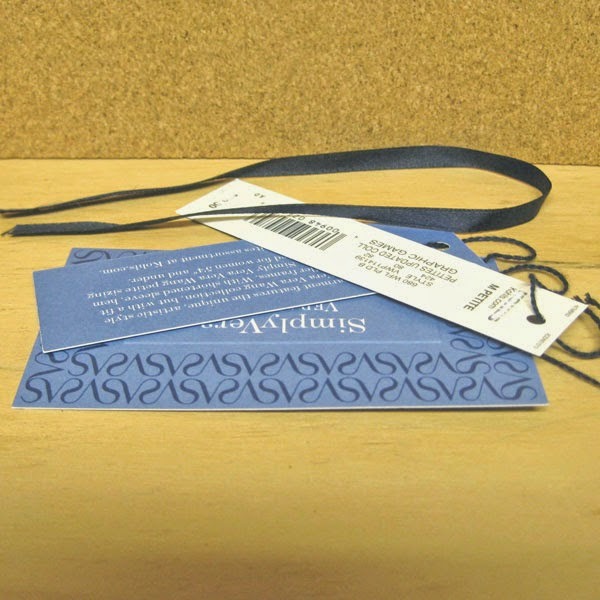 I save about everything, I thought the design and color of the tag was perfect and it also had an eyelet that I thread with some ribbon recycled from the seam in the shoulder of a sweater and wrapped it around the card base of glossy white card stock and adhered with the tag. I simply stamped a sentiment with Memento Paris Dusk ink on white CS, cut with a Spellbinders label die, and attached to the center of the tag. All done. So Simple. Hello! Welcome to summer fun at the beach! I used the challenge at The Kraft Journal for inspiration for my card. 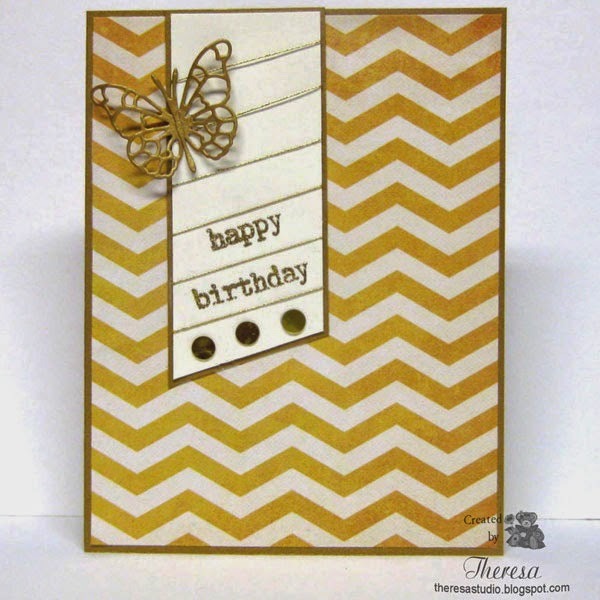 The card base is Kraft CS with a layer of embossed White CS topped with strips of sand paper....great texture. 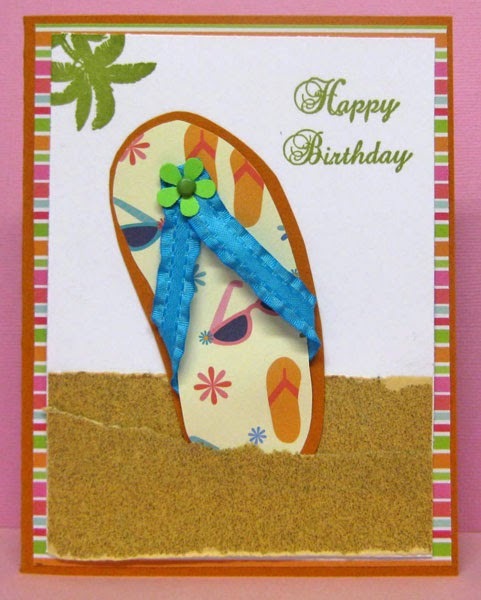 I stamped beach items with Flourishes Beach Life set that I fussy cut and attached to the sand. Whoopsi Daisy Challenge: Summer is here. 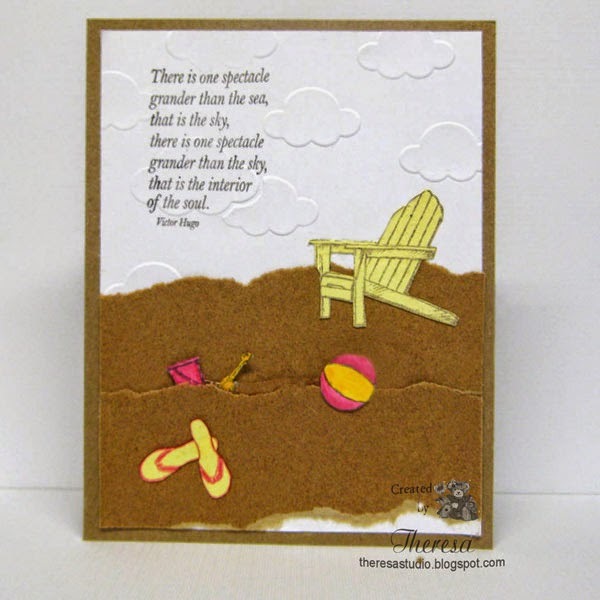 Thanks to my stamping friend, Wanda, for the idea of using sand paper for the beach. Sometimes a card comes to me quickly and out of nowhere. I combined several inspirations and ideas in this card. First, I have several digis from A Day For Daisies that I have not used and wanted to play with one of them . I played around on Photoshop with the digi Free Hand Bird with Musical Notes to color the image using shades of blue and then cut it out using an oval die letting the bird's tail extend out a bit. Using copics B0000 and B21, I added some shading to the image. Inspired by the musical notes on the bird, I decided to stay with a musical theme. I embossed a mat of blue CS with Cuttlebug Allegro EF and colored the edges and raised design with Memento Summer Sky ink. 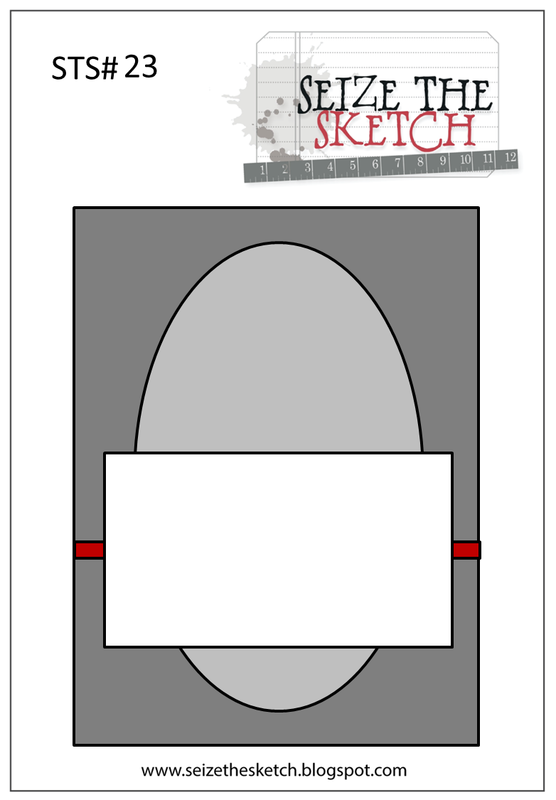 I placed this on a card base of the same blue CS and added the image following the sketch to the right. 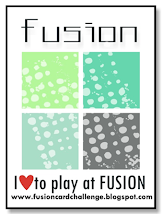 I stamped a sentiment from Flourishes Kid's Play set with Memento Tuxedo Black ink that kept with musical theme. Remember the song Don't Worry, Be Happy? How about the Bluebird of Happiness? 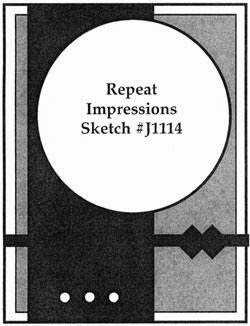 A Day For Daisies Blog: Make a monochrome card. 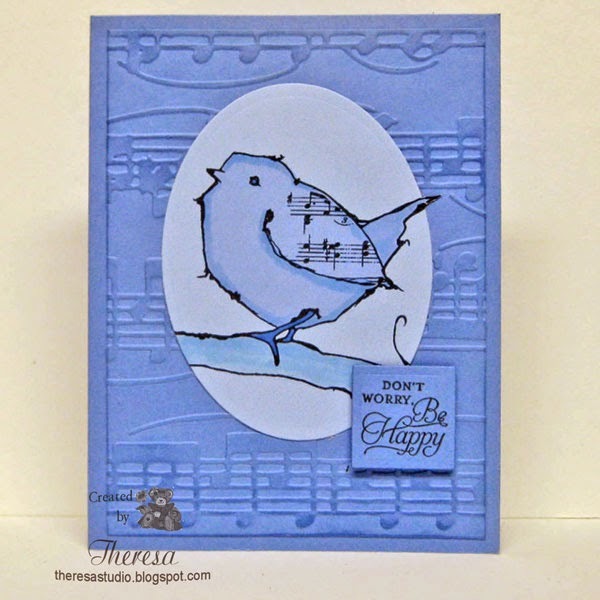 Guess their new release called Blue Birdie got me thinking of Blue Birds and thus the subject of my card. Digi Sketch Challenge: Sketch challenge on upper right with a theme shades of blue. Tied in with my thoughts of a blue bird. You will have to go to my blog if you are opening this in email. Hello! 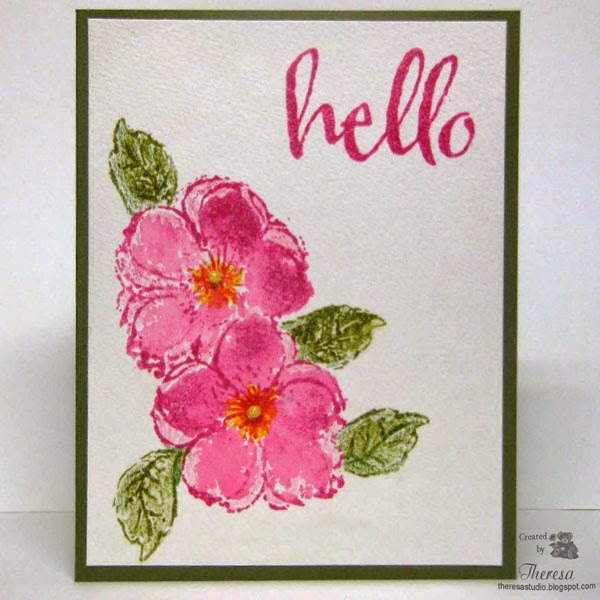 I am back with a card using my fave colors of pink and green and a technique that I seldom use... "Thumping" which is to take a darker colored marker and start tapping or "thumping" on the image to add darker spots. I used the layout from Seize the Sketch and color inspiration from Cupcake Inspirations. Shopping Our Stash Weekly: Color Your Week...use favorite color...that 'd be pink. Mod Squad Challenge: Add a charm to a card. Hello! Today I am back to the appropriate season....getting ready for the 4th of July. Actually I made this card and more of the same for OWH for Any Hero cards. 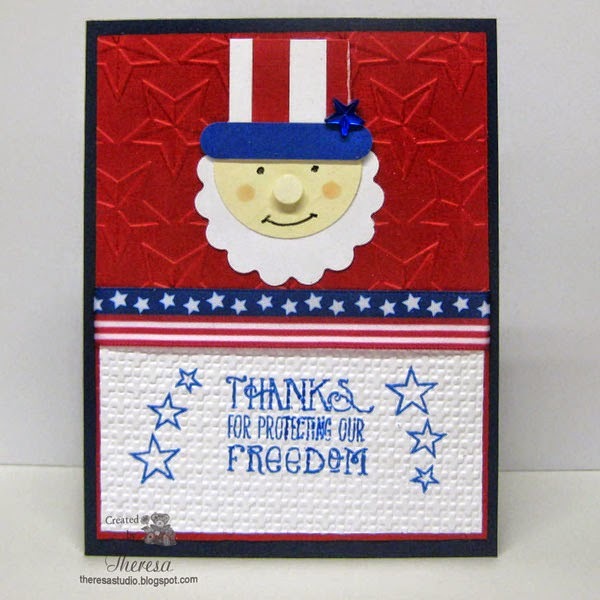 Earlier, I had made a similar design at my Stamping Club which Shelly had made the kits for our meeting. 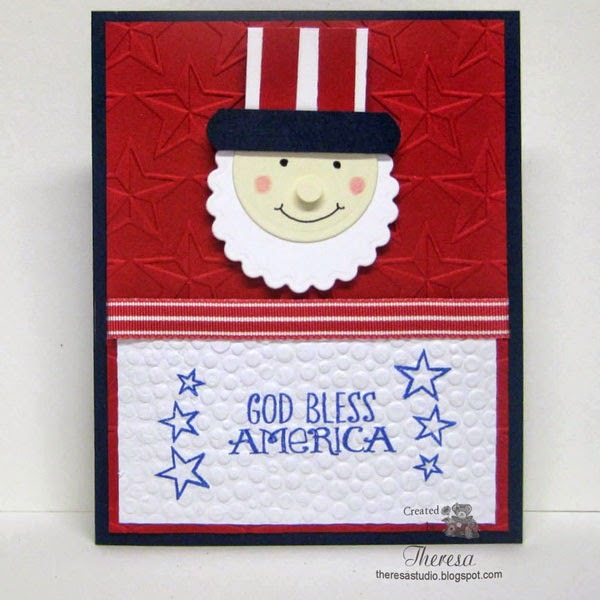 With this card I used Spellbinder dies - circle, scallop circle, square- to make Uncle Sam. Shelly used SU punches for her design which I do not own. I cut the hat brim and rounded the corners with a corner punch. Shelly had used the SU word window punch. Die Cutttin Divas: Challenge - I vow thee to my country -inspired by the country you live in. This is the last of my Christmas cards for awhile.... hope I am not too repetitious. This card was also made with some leftover papers from Heartfelt Creations Christmas Collection. I used a Heartfelt Creations panel with a Candle and Flowers and placed on a mat of Glossy Oyster Pearl CS and then the Dusty Sage card base. 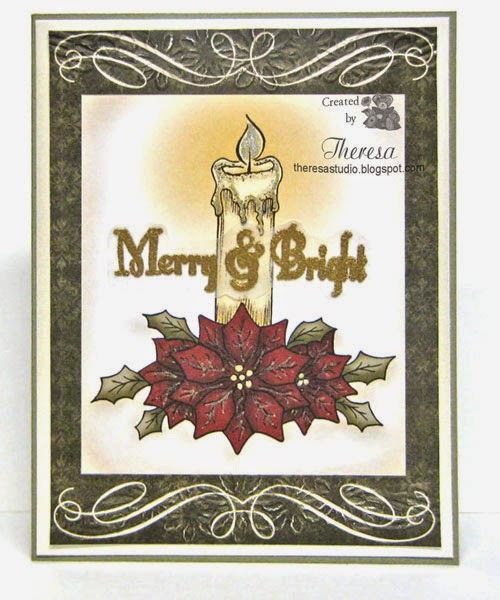 The stamp Merry & Bright is from Spellbinders Heirloom Ornaments stamp set. I stamped the sentiment on Clear Vellum Paper with Versmark and heat embossed with Ranger Gold EP. I fancy cut it out and attached with tape made for use with Vellum. Added more sparkle to candle with Gold Metallic Pen and Clear Star pen. The Glory of Christmas: #36 Challenge Theme is Lights. Hello! I am back with another Christmas card. Again, I started with some paper leftovers from Heartfelt Creations Christmas Collection. 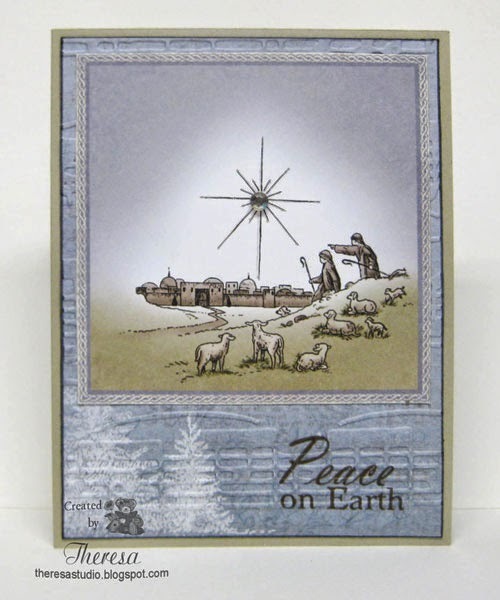 I used a Heartfelt Creations panel with Shepherds looking over the city of Bethlehem. I placed this on a Heartfelt Creations pattern paper embossed with Cuttlebug EF Allegro and then on to a card base of Sand CS. 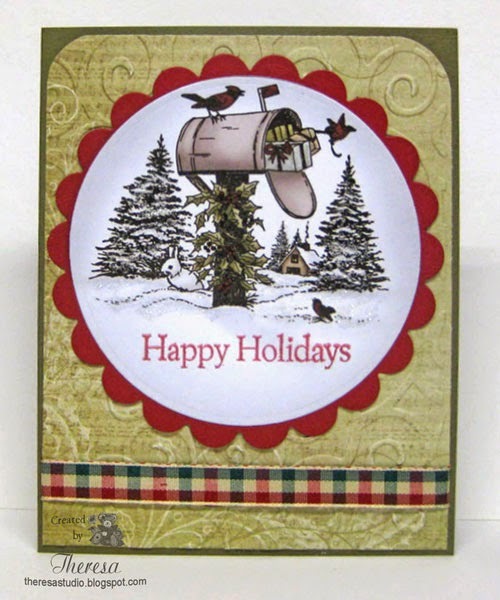 The stamp sentiment is from Mark Finest Papers Greetings of the Season and stamped with Distress Ink Vintage Photo. I added a Rhinestone for the star and some shine with a Clear Star pen to the rays. 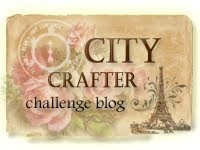 Craftyhazelnut's Christmas Challenge: Include a Building or part of one. One more Christmas card to be posted soon. Stay tuned. Hello! Yes, I know I have my seasons mixed up....I know it is summer and the hot temps are here but for some reason I have been making a few Holiday cards ....may be because of the great Christmas challenges for this week. Once I pulled out some Christmas papers and stamps, I just kept going. I started with some leftovers from Heartfelt Creations Christmas Collection. 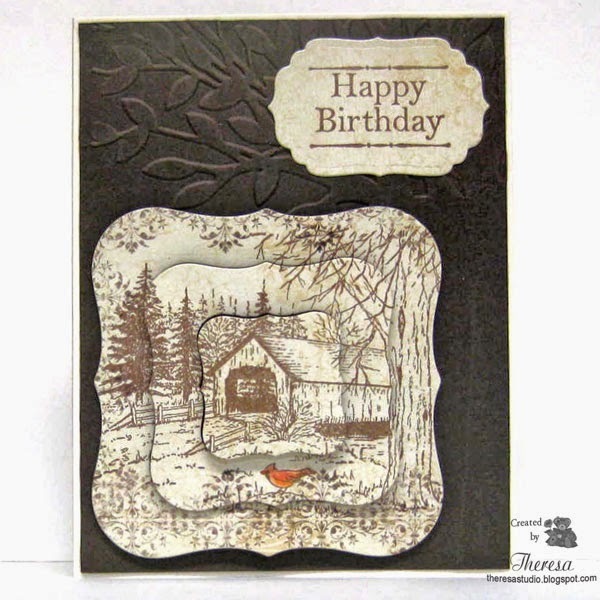 I used a Heartfelt Creations panel with a snow scene with a mailbox and a house in the background. I cut this with a circle die and added to a mat of wine CS cut with a scallop circle die. I placed this on embossed ( Cuttlebug EF Divine Swirls) Heartfelt Creations pattern paper, added a plaid ribbon and then on to a card base of Dusty Sage CS. The stamp sentiment is from Mark Finest Papers Greetings of the Season and stamped with Memento Rhubarb Stalk ink. I added some Frosted Lace Stickles to the snow and trees for sparkle and shine but afraid it does not show in the photo. Craftyhazelnut's Christmas Challenge: Include a Building or part of one. House is at back of scene. Merry Monday Christmas Challenge: Theme is Sparkle, Shimmer or Shine. You will have to take my word there is sparkle and shine on my card from Stickles Frosted Lace. Stay Tune for more Christmas cards. Hello! This card was made for a challenge to make your own background with stamps and I tied in some other elements from other challenges. To make my background, I stamped a GKD flower design all over pink cardstock with Versamark and gold embossed. After trimming this paper, I attached to the gold card base and attached the prepared image and sentiment that were stamped on white CS and also gold embossed. I edged the cut image and sentiment with Versamark ink and also embossed with gold EP since my Gold pen that I use for edges has dried up. 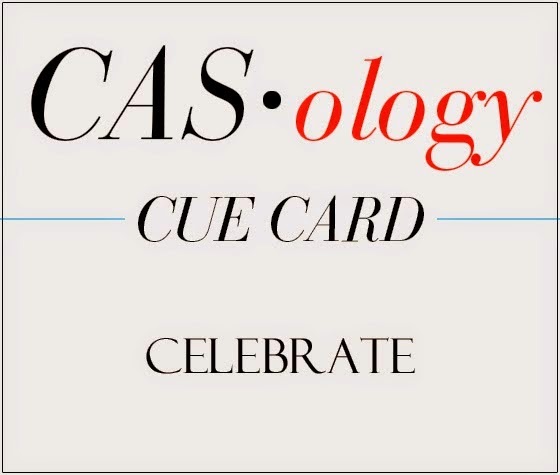 This was a fairly quick and easy card. The color of the flowers and paper match better in real life. I always have trouble capturing the true color of pinks and also yellows in photos for posting. 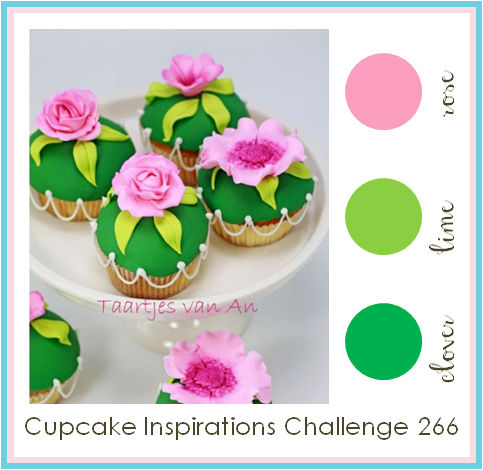 Stamp TV: Mix it up Monday Challenge-Stamp, Stamp, Stamp-Make your own background. Simon Wednesday: Challenge is You Gotta Have Friends. Shopping Our Stash: Use your favorite color. My fave color for making cards is pink. Hello! I have been playing with some new Power Poppy stamps and thought I'd enter one of my cards for the Power Peep of the Week. Each Friday the Bloom Brigade will pick their faves and highlight them, not only on the Power Poppy Blog HERE but on their Pinterest Power Poppy Peeps Customer Creations . I stamped the selected images from Sassy Succulents on white CS with Memento Espresso Truffle ink and colored with Copics. I cut the images and assembled the card following a sketch from Sketch n Stash challenge. I used an Olive Green cardstock base and "cork" looking pattern paper for the background. Love the natural look of the pattern paper with the nature theme. Finished with a sentiment from the same stamp set. Power Poppy: Peep of the Week-share a new Power Poppy creation. Sketch n Stash: Challenge #142 See sketch on left. 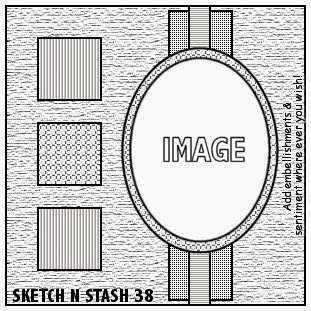 Use newest or neglected stash. I used new stamps. Welcome Summer! Summer arrived this weekend and what a beautiful weekend it was. I have a lot of zinnias blooming, one of my favorite summer flowers. 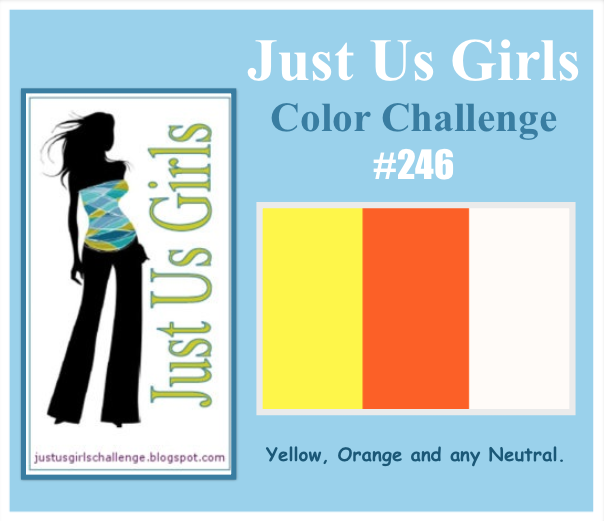 I was inspired to make this card using bright colors of yellow, orange and ivory by the Just Us Girls challenge and a sketch from Seize the Sketch ( link closed before I posted). I do not have any orange zinnias but they do make a bright, colorful bouquet. 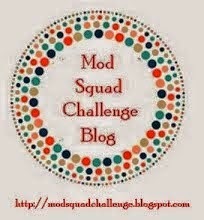 Mod Squad Challenge: Summer Colors. Colored my image with yellow and orange ....very much summer colors. Crafty Ribbons Challenge: Let's go spotty with Ribbon. Spots on my ribbon and also in my image. 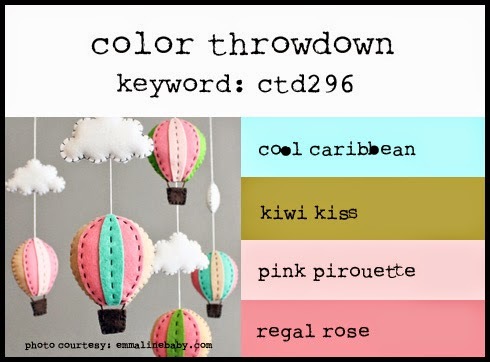 Craft Your Passion Challenge: Theme is The Bold and The Beautiful....use bold bright colors. This card features my fave color combo Pink and Green. 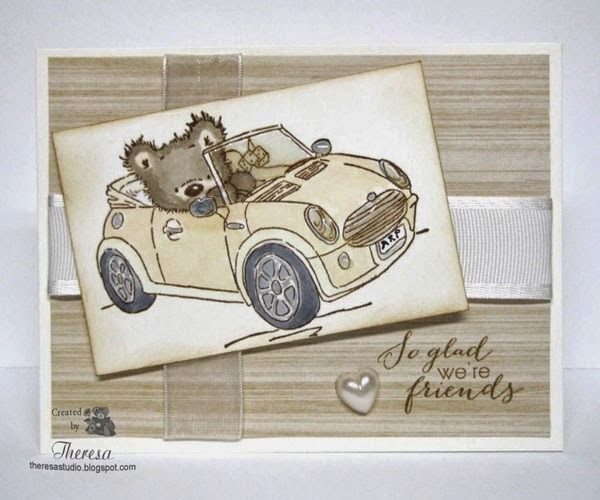 I have used some old stamps from GKD and followed the sketch from Tuesday Morning challenge. I did the decorative right edge of the card cutting freehand. I also fancy cut the stamped flowers after stamping with pink and popped them up at 2 levels with foam dots. I used a die to cut the petals from vellum. Hello! 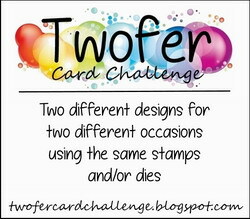 Today I made a card that covers 2 challenges... kind of a 2 for 1. 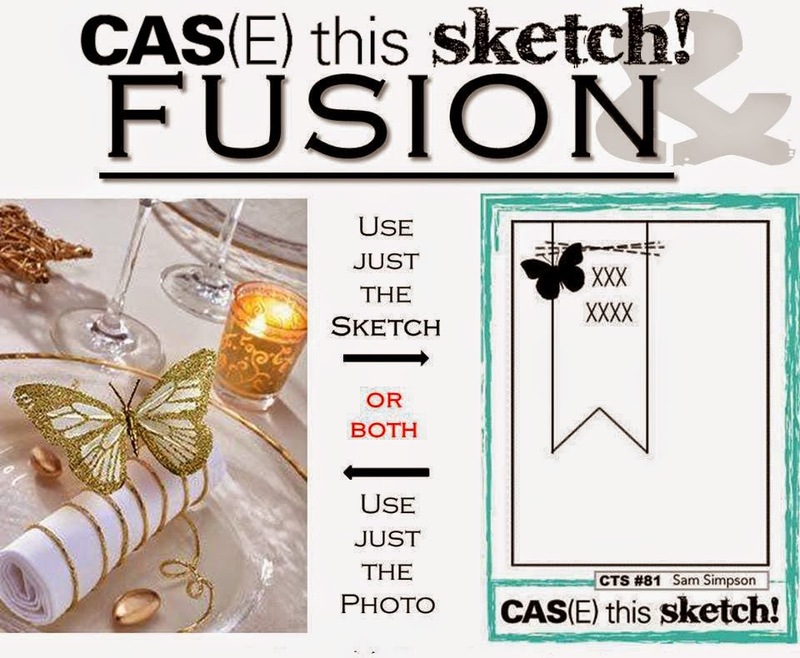 CAS(E) this Sketch is pairing up with Fusion this week for a joint challenge ....use the sketch (good for both challenges) or only use the picture (Fusion challenge only). I decided to combine the sketch and photo inspiration and pulled out the butterfly, gold, shiny, and thread (twine ) elements to use with the sketch. I used a pattern paper as the background and wrapped the ivory strip (modified the shape a bit) with Gold Metallic thread and added 3 gold dots (sequins) and gold embossed sentiment. 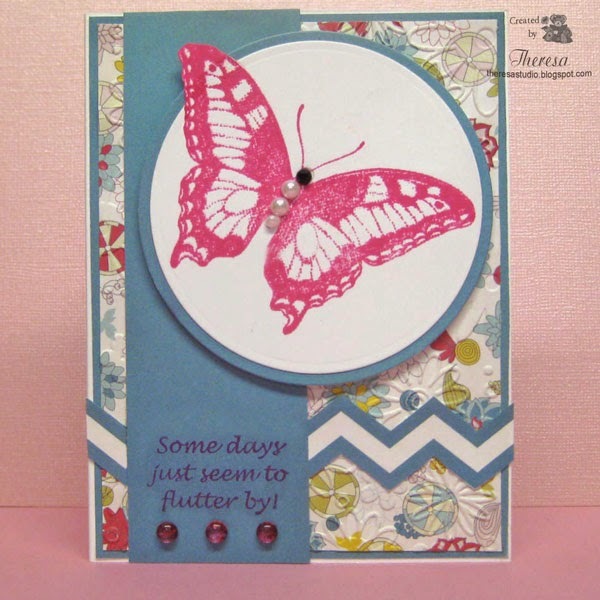 The butterfly die is very delicate....have not used often but like it for this card. 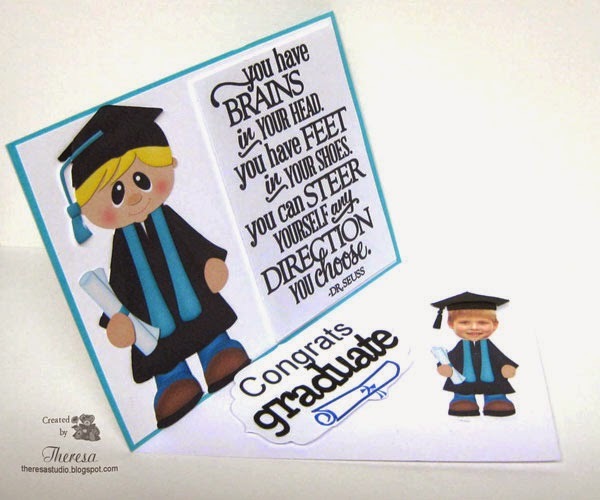 My great nephew, Alex, recently graduated from kindergarten and I made him a congratulations card using the Cameo and a print and cut file of a blonde boy graduate and a verse from Dr. Seuss. 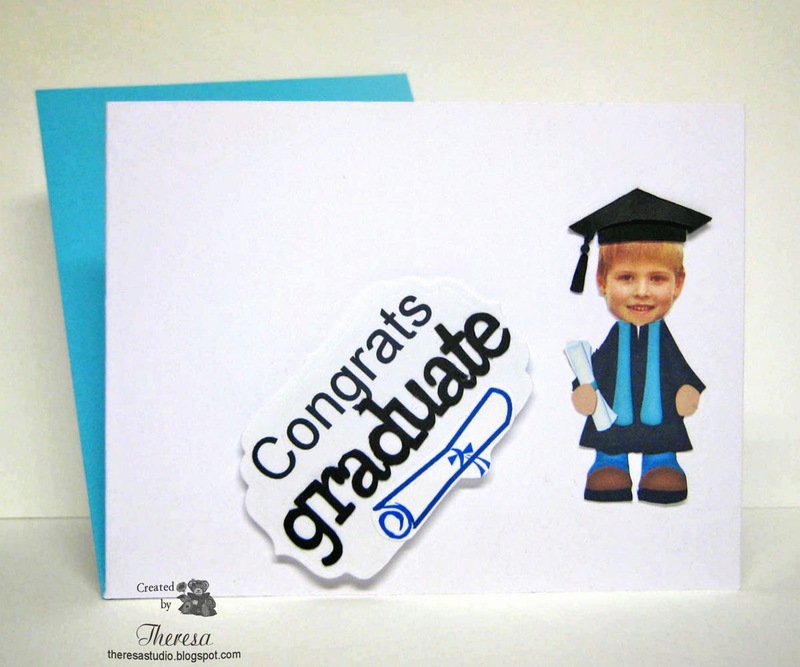 I made a twisted easel card with Alex's photo inside using the graduate cut file printed in a smaller version and graduate cap and graduate word cut files. 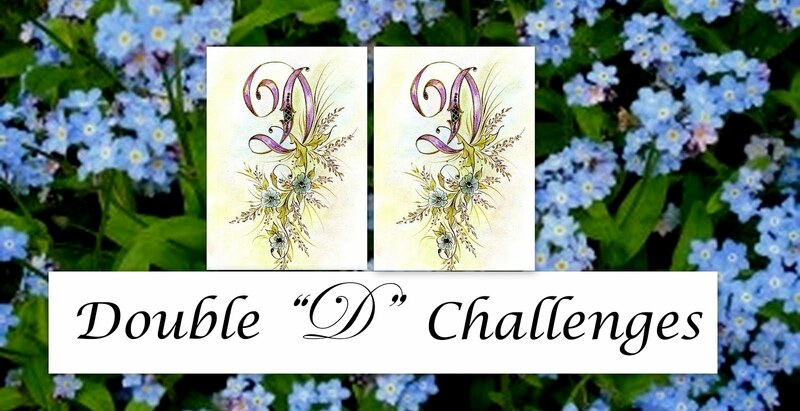 Fab 'n' Funky Challenges: Challenge is Shaped Cards. 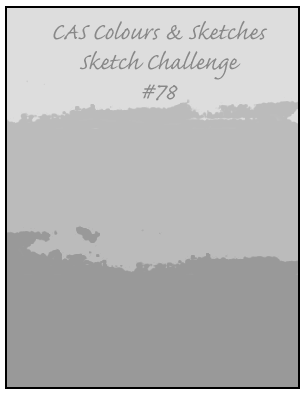 I see some twisted easel cards made for this challenge, so I am entering mine. 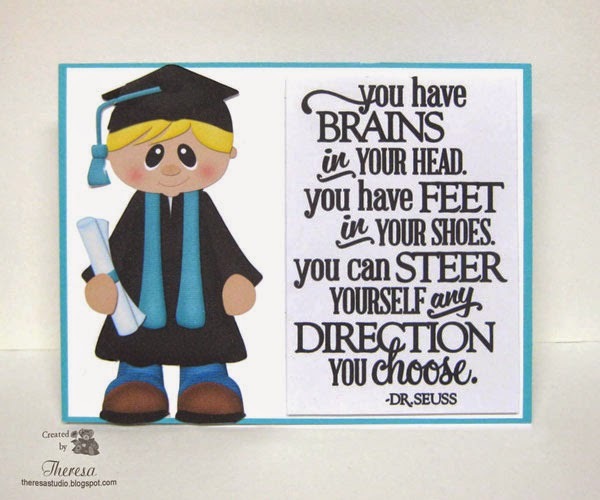 Alex must have looked so cute in his cap and gown at the graduation. Let's Go for a Ride, My Friend! Hello! Looks like a sunny day here...great for a ride in the convertible. 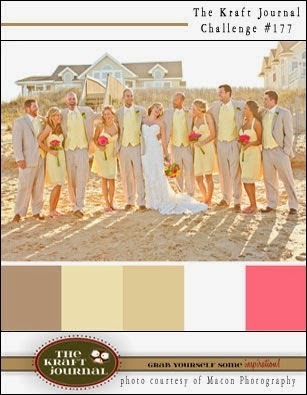 I made this for a color challenge to use Ivory. This was a challenge for me but I gathered up some Ivory CS, Ivory Copics, Ivory Ribbons, and Ivory Pearl Heart as elements for my card. I began with an image Mini Bear from Lili of the Valley which I stamped with DI Brushed Corduroy on GKD Ivory CS. Colored the image in mostly ivory tones. 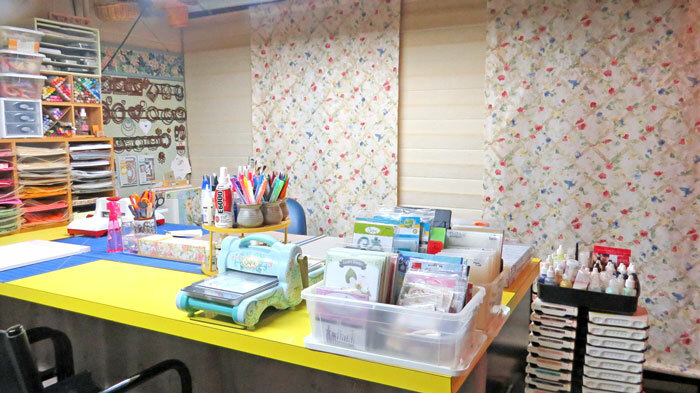 Welcome to my studio! I have made a second card for Joan's Touch challenge to make a card using layered nested frames of a scene cut with dies. More details on how to use this technique and the challenge are on Joan's Blog http://www.joanstouch.com/. While you are visiting, take time to subscribe to Joan's new blog which she began after retiring. 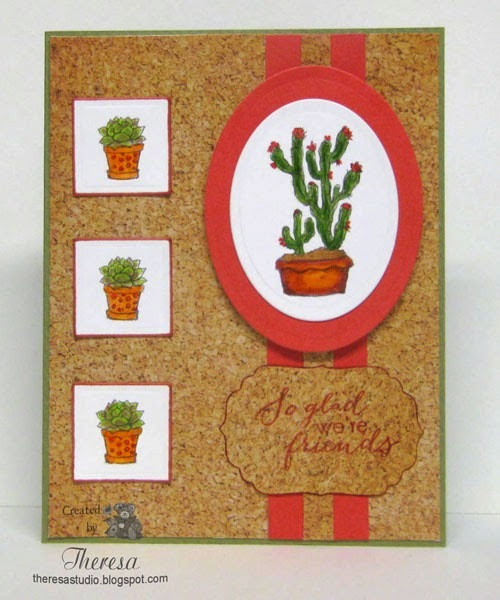 For her challenge, Joan is asking us to use a scenery stamp, make a layer as she did (check her blog for details), use any color, and use a product sold at Joan's Gardens. . All Heartfelt Creations Products used are from Joan's Gardens. I stamped the scene on a Pattern Paper which adds to the background. I used more color in this card than my first one. I used pencils and white pen to add greens to the mountains and white to the clouds. The pattern paper is predominantly shades of blue. Hello! Back for a second post today. I recently purchased Hero Arts Cling Stamp Leafy Vines...just had to have. I used the stamp to make a One Layer card for a couple of challenges. 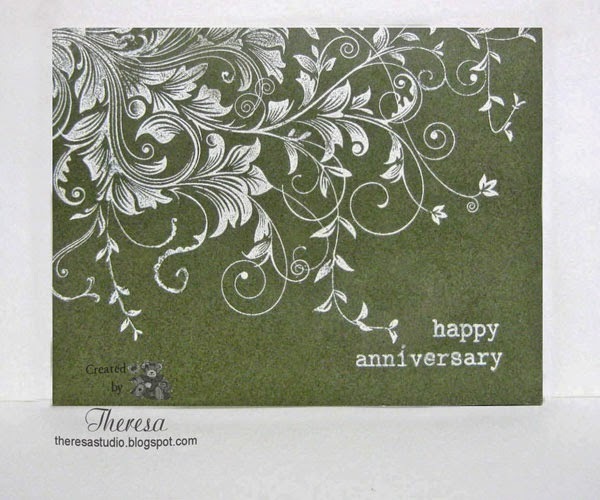 I stamped the vine with Versamark Ink off the edge of a Green Card base and heat embossed with White EP. Added a sentiment from Winnie & Walter set The Big, The Bold, and The Happy. 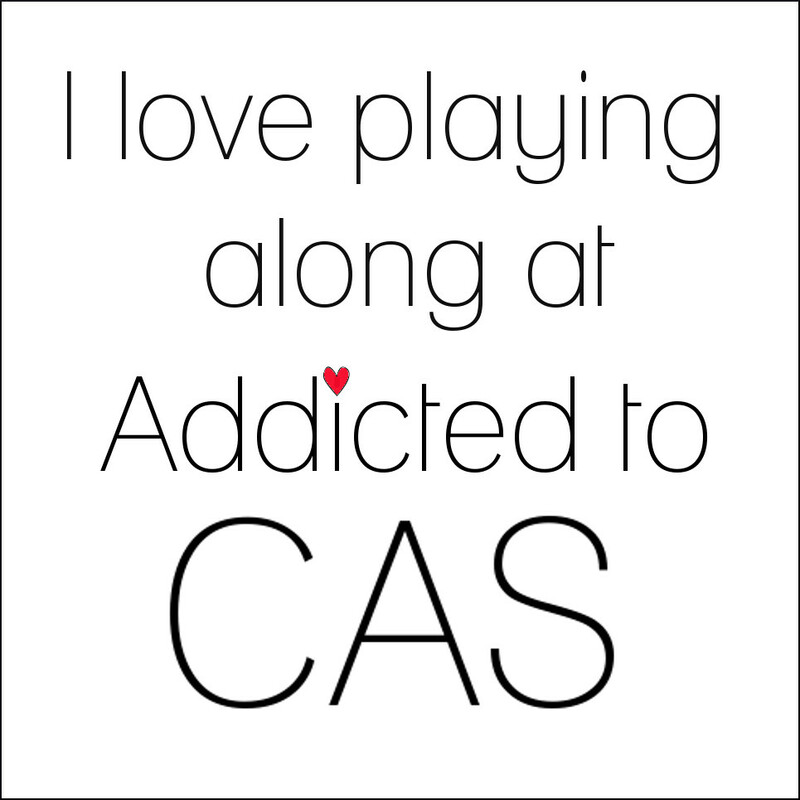 This was a very quick CAS card. The Paper Players Challenge: There was a choice of challenges this week for their 200th challenge. I did the One Layer Card challenge. 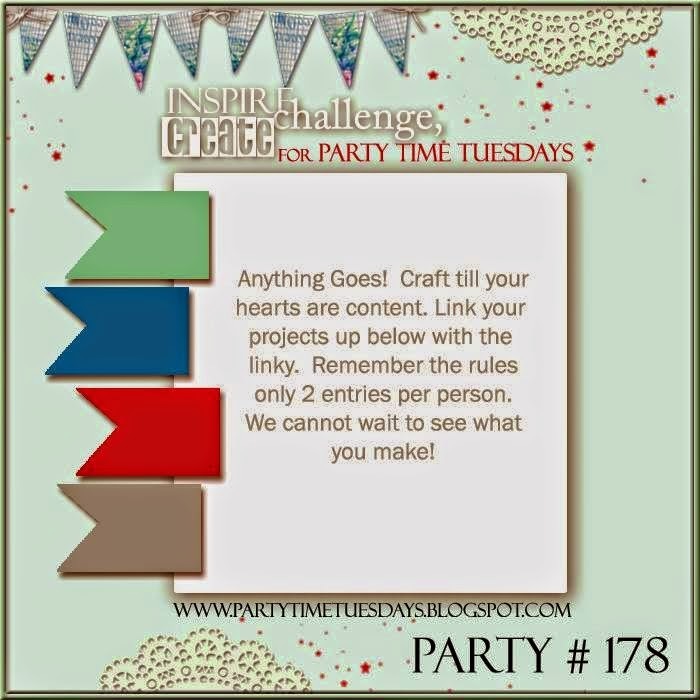 Craftyhazelnut's Patterned Paper Challenge: June - Anything goes as long as your creation is covered with patterned paper. 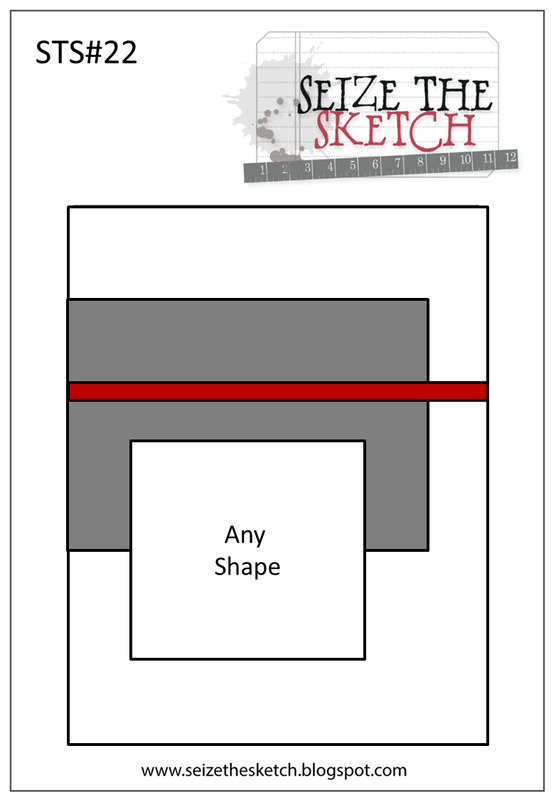 This is a card made using the sketch challenge at CAS Colours & Sketches. Rushing to meet the deadline. I made a few attempts before I was happy with my design. Used some water spritzing with Distress Inks Tumbled Glass, Broken China, and Peeled paint on watercolor paper. 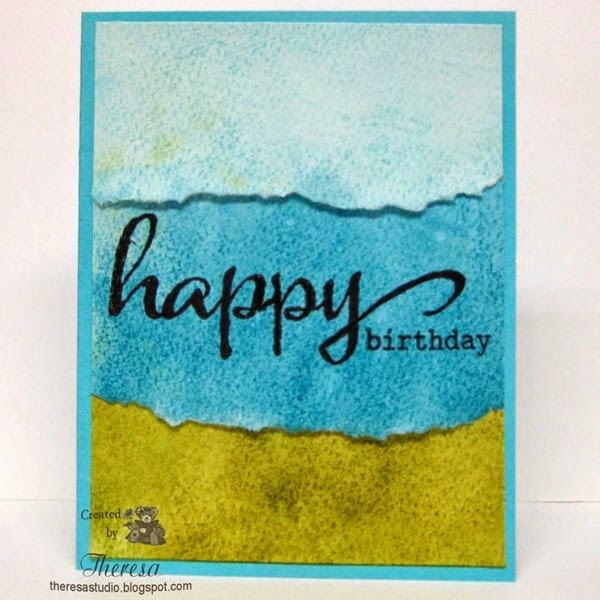 Tore 3 strips - one of each color and - arranged on a Turquoise Card stock as the base. Stamped sentiments from Winnie & Walter The Bold, The Big, and The Happy set with GKD Black Onyx ink. Morning! I used to play with watercolors a lot but not too much lately. There seems to be a lot of recent interest in water coloring especially for challenges. 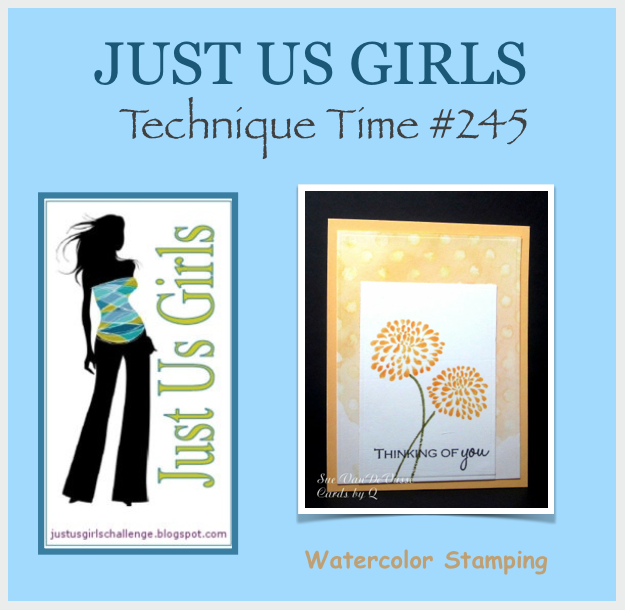 Just Us Girls challenge this week is watercolor stamping - ink your stamp with dye or Distress Ink then mist the stamp and stamp onto the cardstock. 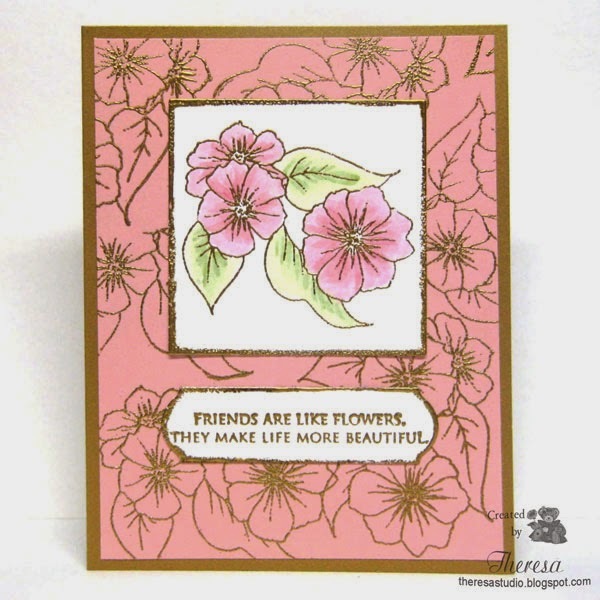 That is just what I did on this card using a floral stamp on watercolor paper and using masking to layer the flowers. This is a simple card but was so much fun. 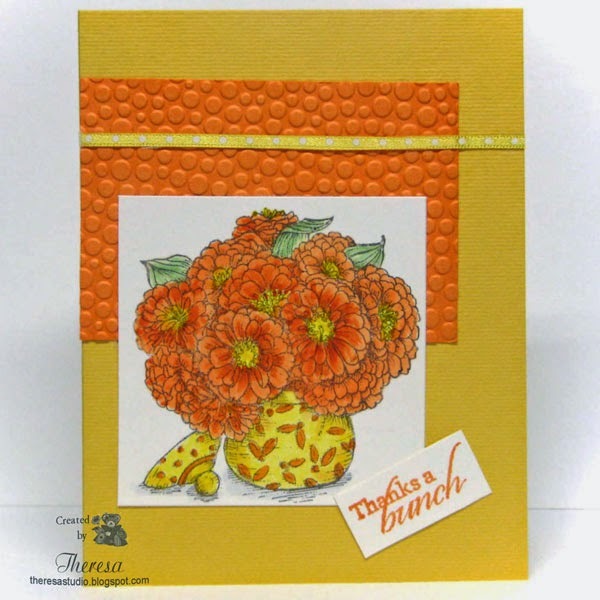 This card is for Joan's Touch challenge to make a card using layered nested frames of a scene cut with dies. More details on how to use this technique and the challenge are on Joan's Blog http://www.joanstouch.com/. While you are visiting take time to subscribe to Joan's new blog which she began after retiring. 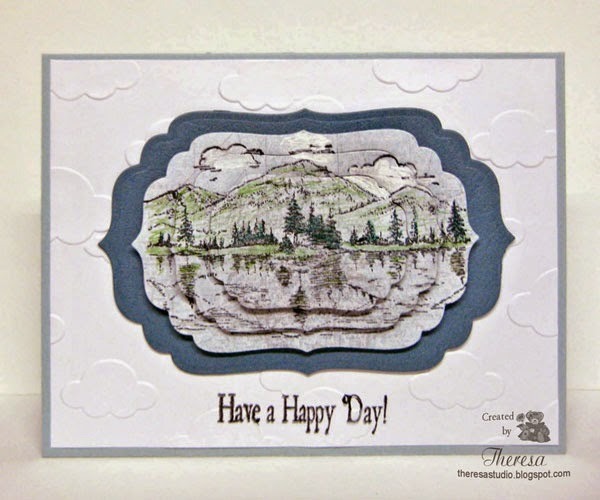 For her challenge, Joan is asking us to use a scenery stamp, make a layer as she did (check her blog for details), use any color, and use a product sold at Joan's Gardens. All Heartfelt Creations Products are from Joan's Gardens. I stamped the scene on a Pattern Paper which adds to the background. I chose not to color scene except for the bird in the foreground. Dies: Spellbinder Label 1 --used 3 dies for the layers and Label 4 for the sentiment. Power Poppy Blog has a new feature for us to share our Power Poppy creations and show our stuff. It can be anything -- a card, an altered item, a 3D creation, a set of cards.etc. 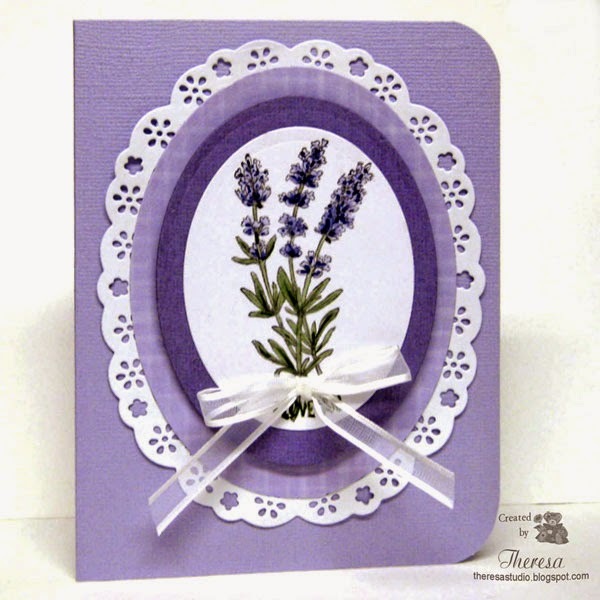 I have made a card with an old-fashioned look using Power Poppy new stamp set Lavender. I stamped the Lavender with Memento Espresso Truffle ink on white cardstock and colored with Copics BV0000,00,08, G85,99. I cut the image with Spellbinders Oval Die and placed on an Purple oval mat layered on a oval mat of pattern paper. This was framed with a white oval cut with Cheery Lynn Swedish Spring Frame. Stamped the sentiment "I Love You" with Memento Olive Green ink but it is hidden in the photo by the White Organza/satin bow that I added. I love this new stamp designed by Marcella Hawley for her company Power Poppy. Please check out her designs here. Hello! This will be a quick and short post. I am late making an entry for Joan's Touch challenge and rushing to squeeze this in before dinner. The challenge is to use black and white, dimension, scallops, and use a product sold at Joan's gardens. 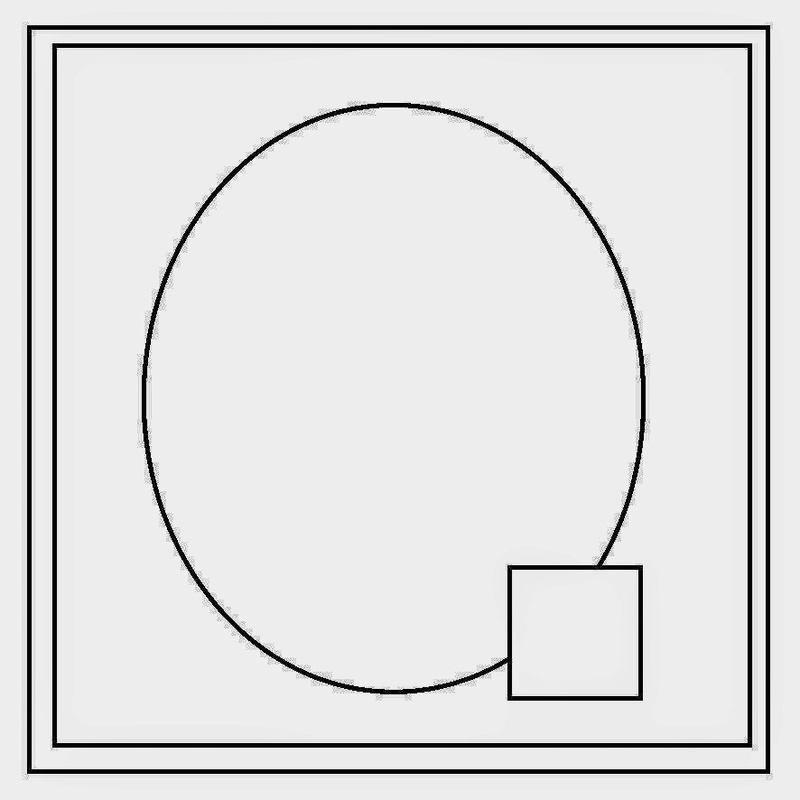 Pop up dots between White layer and Black Frame, between Black Frame and Image to give dimension. Welcome! My great nephew celebrates his 3rd birthday next week. I have fun making cards for him and his brother and always try to personalize the cards with a special touch. 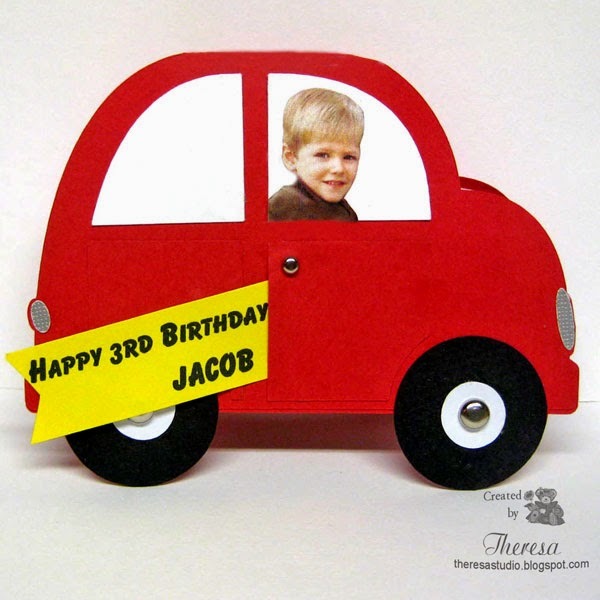 I decided to use my Cameo to make him a car shaped card using a Silhouette cut file designed by Lori Whitlock. I added brads to the tires and door and used metallic texture cardstock for the lights. The car was cut from Red, White, and Black Cardstock and the windows are Glossy White CS. I added Jacob's picture to the window. Isn't he the cutest? I made the banner sentiment and inside message using Print Shop to print. This card is A2 size so it fits in a regular envelope. 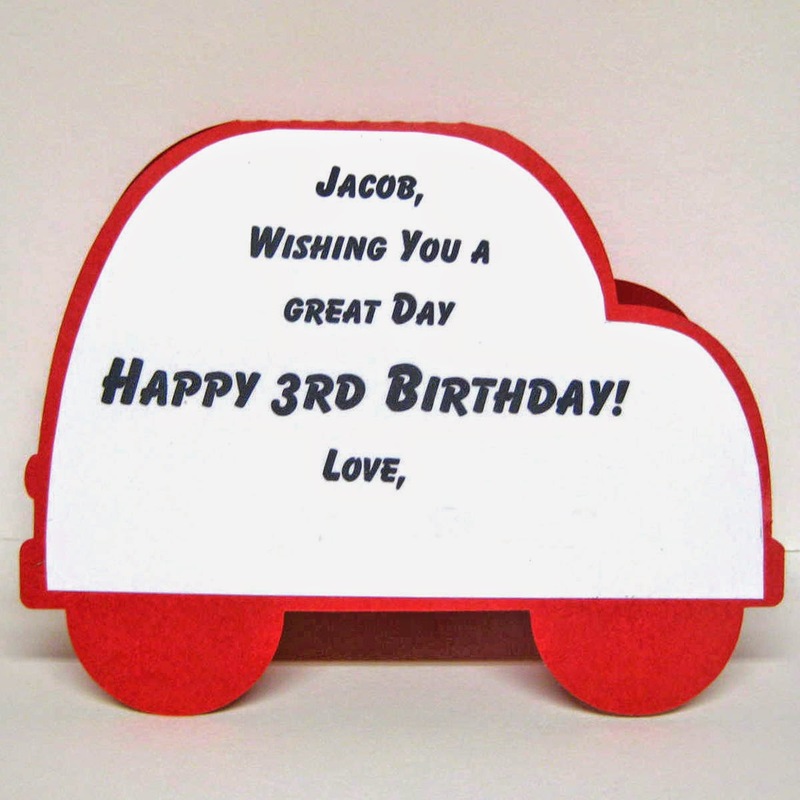 I hope Jacob likes his card....don't all 3 year old boys love to play with cars? Cute Card Thursday: Challenge is So Macho! Hello! My card today is for a challenge at The House That Stamps Built- Joy's Designer's Choice Challenge #64 to make a card with a Baby Theme. I found this old Pattern Paper in my stash and decided to base my card on the bear and colors in the pattern. Hello and welcome! The last few days have been spent working in the gardens....spreading mulch in the beds. It's not my favorite way spending time but it is so worth it when it's all done. This is a card that I enjoyed making as I love flowers and coloring. I have had this Joanna Sheen stamp for some time and it was so much fun to color with Copics trying to match colors in the challenge graphic below. I just framed the image with a layer of the embossed green cardstock cutting the oval with a die. Added some twine with the tag and placed on the pink card base. 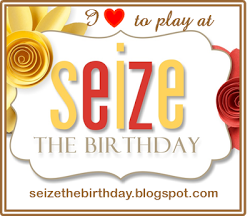 Seize the Birthday: Anything goes for Birthday with option Summertime. 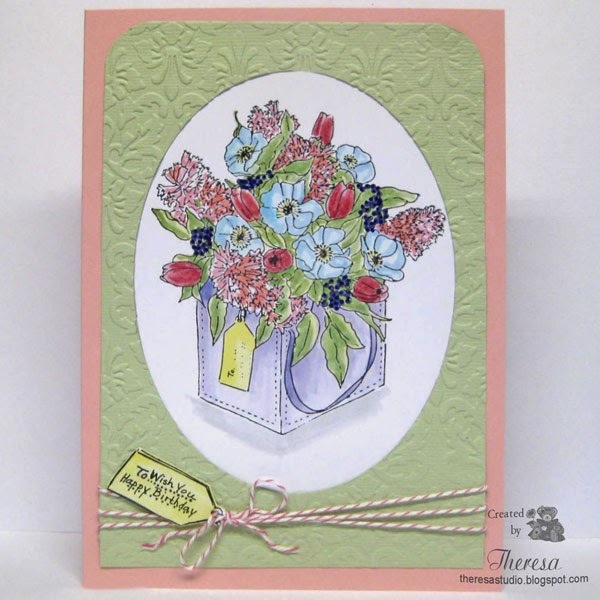 The flowers on my card would be picked from a summertime garden. NBUS Challenge #1 with Darnell: Anything goes with Friendship Theme. The meaning of NBUS is "never-before-used schtuff.". Made this card for a friend, so hope it meets the friendship theme. First time to use this stamp which I won sometime ago.